Four years ago, single mom Kathy Tahtinen wouldn’t have put her name in the same sentence as Harvard University. Now, she’s considering online courses at the Ivy League school this fall. Two years ago, Alan Holcombe was sitting in his cubicle in a Grand Rapids bank, second-guessing his choice of a finance degree. Next week he’s headed to an industry conference in Maryland, all expenses paid, to see just how far his engineering technology degree from NMC will take him. Brian Sweeney’s educational resume includes degrees from West Point and Cornell. Now the Army retiree has come full circle to teach at NMC, where he took his first class as dual-enrolled student, building one of the college’s newest programs, photonics. The trio have each received recent scholarships that collectively showcase not only the breadth of Northwestern Michigan College offerings, from transfer to technical, but the excellence across the board. 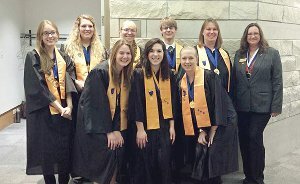 Tahtinen, 38, (pictured above, back row, second from right) has been named the New Century Scholar for Michigan, among just 57 outstanding community college students chosen from 1,700 nominated internationally. She’s a member of Phi Theta Kappa, the international community college honor society, and will graduate in May with three associate degrees. The scholarship will help the single mother of two high school students – one of whom shares her classes as a dual-enrolled high school student – continue pursuing a bachelor’s degree. The Harvard extension opportunity would allow her to earn a degree while taking classes mostly online. Her NMC transcripts qualify her to take three pre-admission online classes, which would in turn determine whether she could apply for official admission. 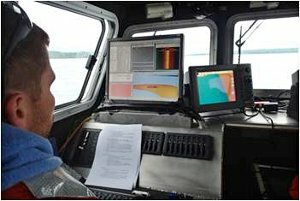 Holcombe, 28, and fellow student John Lutchko both received scholarships from the Hydrographic Society of America. Engineering Technology didn’t exist at NMC when Holcombe graduated from Suttons Bay High School in 2005, and he went on to earn a bachelor’s in finance and economics from a four-year school. The employment odds have turned in his favor, and he expects to be able to field multiple job offers after he graduates this spring. “I can’t wait to see where it takes me,” he said. Sweeney, meanwhile, will oversee a $15,000 grant from the National Center for Optics and Photonics Education (OP-TEC) for both scholarships and student recruitment. Photonics involves the use of lasers and other electro-optical devices in fields like manufacturing, medicine, aerospace, IT and defense. NMC was one of just four schools nationwide to receive the funding. Sweeney, 50, says the hands-on training provided is the reason why. “West Point and Cornell had a lot of theory. We didn’t have a lot of grabbing the wrench and turning it,” Sweeney said. Photonics started at NMC in 2012 and this is the second year the college has received the OP-TEC grant.